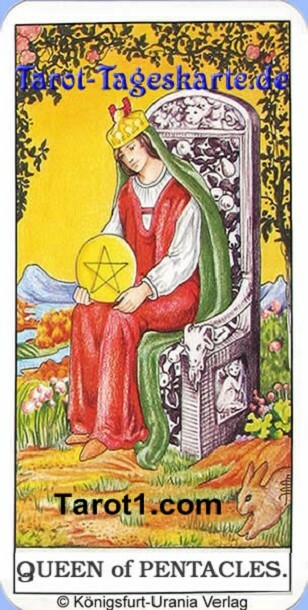 In a beautiful and fertile landscape the Queen of Pentacles is sitting on this Tarot card on her throne. She is regarding with a satisfied face a coin on her lap. The queen is standing for a hardworking, reliable woman who means well with us and will be important for our life. In your partnership a hardworking, reliable woman will be important for you and she can take a bigger part than you might want it. This women can be a good friend, but she can also act as a competitor. If you are single, then you will meet a hardworking woman today, who will impress you. You will have a trouble-free day today, if you are hardworking and reliable. Try to be active in everywhere, where you can help. Professionally today you will work together with a practically woman. She can be very useful for you. If you are interested in Tarot, please take a look in our unique >> Cartomancy Online Shop >>. You will find hundreds of fortune telling cards, many Tarot and a lot of cartomancy equipment.